The first wave of employees was supposed to be settling into the new headquarters building for the JR Simplot Company this week, but now that won’t happen until 2017, the company confirms to BoiseDev.com. A leak on the 7th floor of the building affected portions of the west and central sections of the building, according to manager of government & public relations Ken Dey. “No one was hurt during the incident and we were fortunate that no employees were yet in the building,” he said. The leak was first discovered the week before Thanksgiving, and by Friday November 18th, a fleet of trucks for disaster recovery company Belfor were parked on the west side of the building. The smaller trucks have been replace by semi-trucks with “National Disaster Team” on the side. That group helps in large-scale disasters around the country and specializes in water damage incidents according to Belfor’s website. 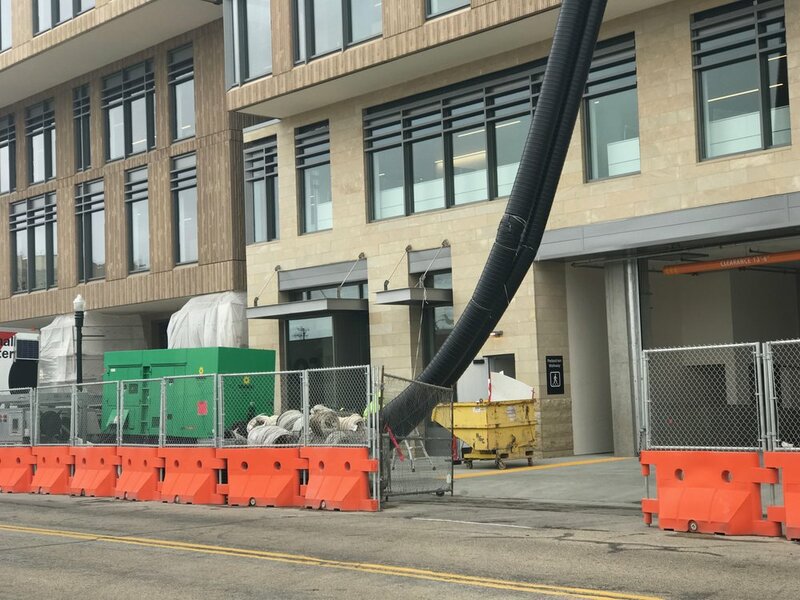 A large generator is parked along 10th Street, which is hooked to a pair of black tubes which appear to be pumping air into an area above the fifth floor. 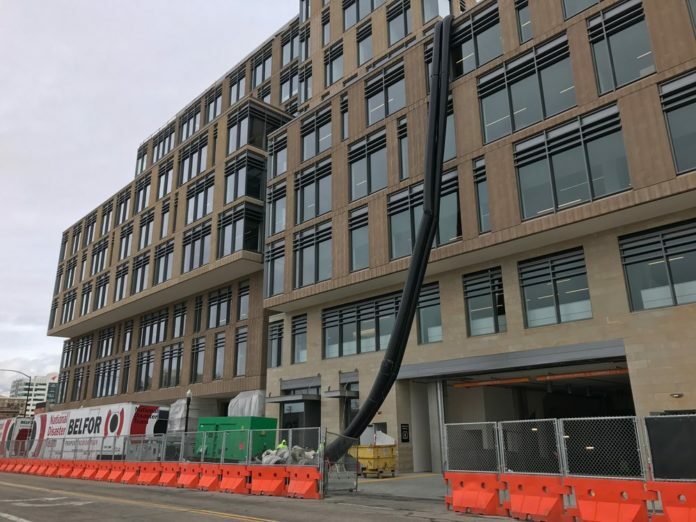 Six waves of employees were to be relocated to the 10-story corporate campus from several locations around town starting before Thanksgiving and extending into next year. The company has now rejiggered that plan with four waves of workers starting to migrate in early January. “Our new plan, which is dependent on completion of repairs… would allow us to be completed by mid to late February,” Dey said. 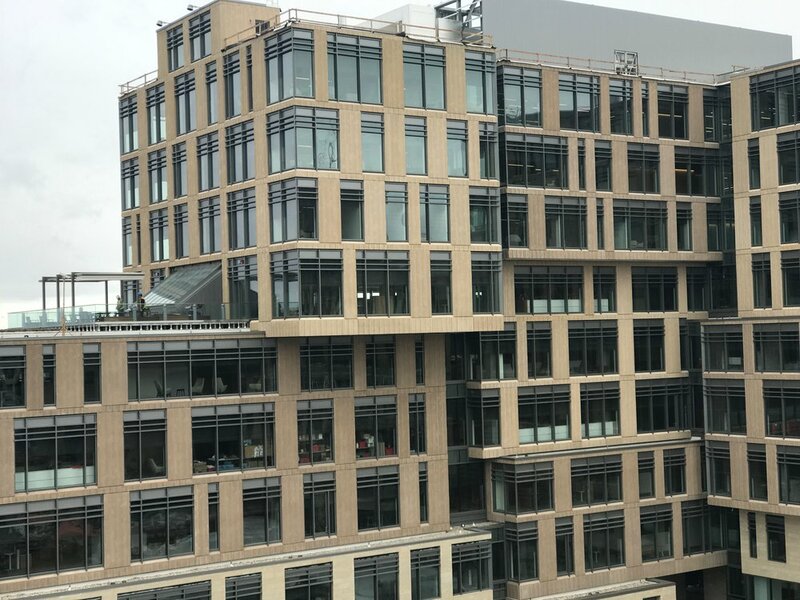 The 335,000 square foot headquarters building is complemented by the adjacent Jack’s Urban Meeting Place facility, and will share a common park area when construction on the two projects fully wraps up in 2017.